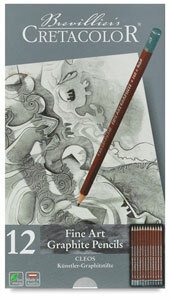 Creatacolor Fine Art Graphite Pencils are the ultimate tools for all sketching, drawing, and hatching applications. Cretacolor is the direct manufacturing descendent of the company started by Joseph Hardtmuth in 1790, which produced the first pencil leads by using a mixture of graphite and clay. Well known for their superior quality, these traditional pencils are made by mixing and then grinding together different types of graphite with high-grade fireproof ceramic clay. This special clay gives the graphite high breaking strength. Creatacolor Fine Art Graphite Pencils are housed in a hard cedar wood casing, which guarantees utmost strength and easy sharpening. Pencils are pre-sharpened. Set of 12 — This set includes one each of 9B, 8B, 7B, 6B, 5B, 4B, 3B, 2B, B, HB, F, and 2H, in a tin box.